I believe this image was originally created in the 1940s; the postmark I have on the back of this postcard is dated 1953. 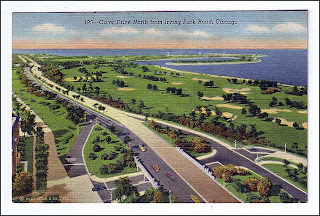 The perspective is from Irving Park road, looking north. You can see Montrose Harbor in the distance. This is a great idea for a blog! I was wondering if you have any postcards showing the 800 block of Windsor Ave. in Uptown? I went the Chicago Historical Center but no dice, I've been to the antique shops which have large collections, but have never seen anything. The building I live in used to be the Windrake Hotel, if you have anything please post it! Thanks! I don't think I have anything of the 800 block of Windsor, but I'll keep my eye out. So many of the beautiful apartment and condo buildings in Uptown used to be hotels. In order to purchase many of the postcards and other images we post on our site, which you are welcome to use, we sell other stuff that we find at Chicago-area estate sales. Check out our latest Etsy offerings. We've added a contact form to make it easy to upload your Uptown-related images and stories or send us a message! Go to Share Your Story! We're pleased to offer a free facsimile edition of the 1925 Balaban and Katz Magazine featuring the opening of the Uptown Theatre in Chicago. Click image or link to download the free PDF. A vintage poster of the Edgewater Beach Hotel, which once stood at Foster and Sheridan. Click image to purchase.